Linguists play an important role in helping us understand the culture, history, and contemporary life. Lost languages have a significant impact on our world. Native American individuals from different tribes have different perspectives with regard to the preservation of their unique languages. Tribes are using language preservation strategies to address language loss concerns and revitalize their languages. Every spoken language changes over time. 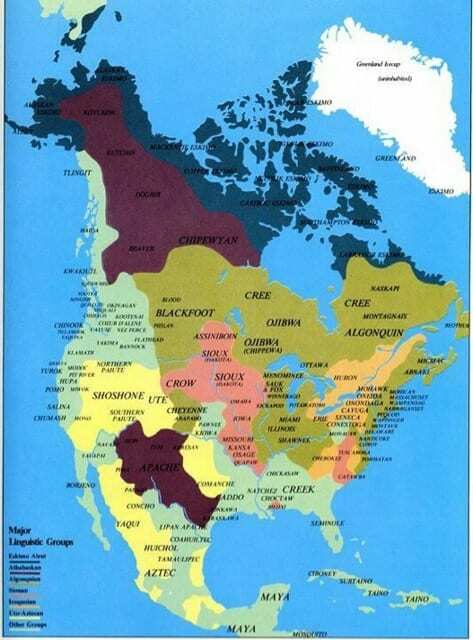 All of the American Indian languages spoken in North America originated from six main language families. Some Plains tribes share the same language families, but their languages are still very distinct. How do the words you use establish your identity? How does an understanding of linguistics enable us to communicate better? What does that fact that we have 850 new words in one year say about us? What does such a rapid rate of change mean for other languages? What are the advantages of being able to speak multiple languages, beyond just being able to communicate with someone? What does retaining their Native American language mean for Native people living today? What does it mean for all of us if a Native American language is lost? Languages are fluid and move across the landscape in predictable and unpredictable ways. 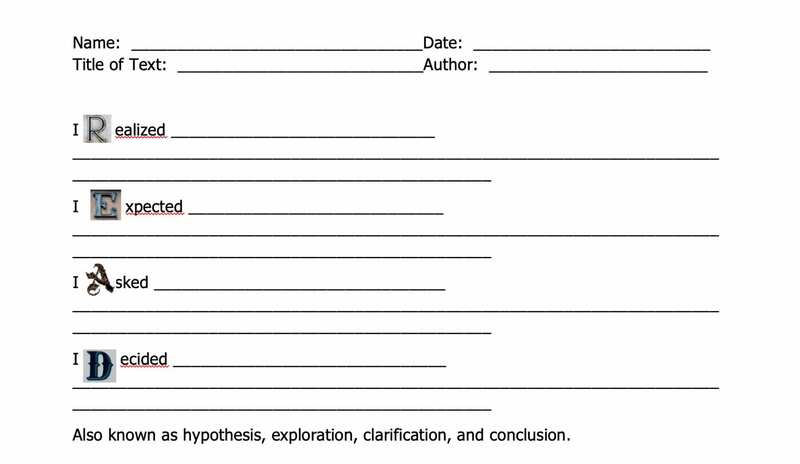 Brainstorm a list of ways language establishes identity and record this in a journal. An analysis of the current state of a chosen Montana Native American language. Entry Question(s): Today we’re going to be talking about languages, but before we begin, think about your own language, not just what language you speak, but how you use that language to communicate in a wide variety of different scenarios at school, at home, with peers, and professionally, in written forms and in spoken forms. In your journal, consider this question: How do the words you use to establish your identity? Write down a brainstorm list of ways language establishes your identity. “Native American Languages,” a free online essay by Maryanne Mithun and Lyle Campbell, University of California, Santa Barbara. “We Put a Bunch of New Words in the Dictionary,” a free online essay by Miriam-Webster, September 2018. “Dying languages: Scientists fret that one disappears every 14 days,” a free online essay by Raveena Aula, The Star, April 15, 2013. “A talk with Janine Pease, Coordinator of the Crow Summer Institute,” a free online essay, n.d. Situated Practice: What is linguistics? What value is there in studying languages? Before you answer that question, let’s watch this clip. Show the clip listed in the materials for the movie Arrival (5 minutes). Turn to your table mates and discuss what this movie attempts to portray about languages. How does an understanding of linguistics enable us to communicate better? What are your thoughts about the director’s perspective of the current state of communication? All of the modern languages spoken by tribes today are derived from one of the original language families depicted on this map (distribute the map showing language families that is included at the end of this lesson). Using the map, take one page in your journal and write down from which language families our modern Plains languages are derived. Blackfoot, Arapaho, Assiniboine, Cheyenne, Comanche, Crow, Gros Ventre, Kiowa, Lakota, Lipan, Plains Apache (or Kiowa Apache), Plains Cree, Plains Ojibwe, Sarsi, Nakoda (Stoney), Tonkawa, Arikara, Hidatsa, Iowa, Kaw (or Kansa), Kitsai, Mandan, Missouria, Omaha, Osage, Otoe, Pawnee, Ponca, Quapaw, Wichita, and the Santee Dakota, Yanktonai, and Yankton Dakota. Watch the video, How does a language change? (15 minutes) Remember, we’re approaching our understanding of the history and current events of the Plains Tribes through the lens of linguists. Language is fascinating because it’s always changing. As a perfect example of this, think about the words your parents use that are not used much by people your age and think of the words you use with your friends that your parents are still trying to interpret. Every year, new words are added to our dictionary because our English language is constantly responding to the environmental, social, political, or technological changes in our world. In 2018 the Mirriam-Webster dictionary added about 850 new words to the list that are now a part of our shared vocabulary in English. While that seems like a lot, it’s actually a fairly average year for new words. Read: “We put a bunch of new words in the dictionary.” Ask: What does the fact that we have 850 new words in one year say about us? What does such a rapid rate of change mean for other languages? How do modern Native people living in North America bring these 850 new words into their languages? Do they need to create their own parallel words in their languages or do they simply integrate these English words into their speech in their own languages? These are issues that tribes, concerned about retaining their languages, are grappling with. How much do you think it sounds like another Siouan language? Even though both of these languages come from the same language family, you can hear that they are very different. A linguist can recognize the ways in which these languages may be linked, but the untrained ear is unable to do so. In an effort to preserve the Apsáalooke language, the Crow people have begun to get more creative in the ways in which they make the Crow language accessible to young people. Janine Pease mentioned a couple of different strategies being used to increase the amount of Apsáalooke language used by children and young people. Another approach that Crows are trying is a Crow Language app. You can locate this app on your phone by searching “Crow Apsáalooke”. This phone app is an interactive way for people to learn important Crow words and phrases, but it does not go so far as to be able to coach students in conversational Apsáalooke. At the time that Lewis and Clark encountered the tribes along their journey many different languages were spoken. Native American people spoke their own tribal language and often knew several other tribal languages. In addition, many of them had learned English, Spanish, or French through the presence of explorers and traders and used Native American Sign Language as a more universal form of communication. 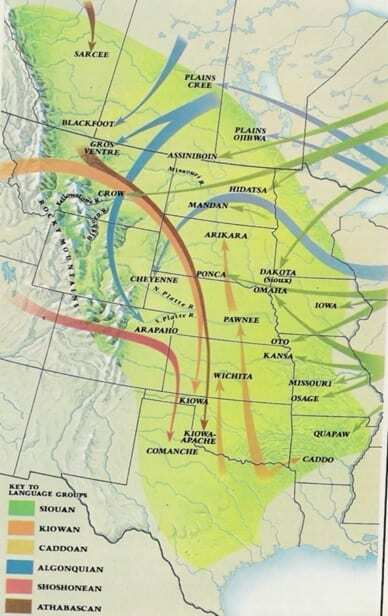 The map of language movement (included at the end of this lesson) illustrates how Native languages moved through the U.S. as people employed them. This scenario mirrors the way people of countries outside the U.S. often speak multiple languages as a result of living in areas where many cultures mix. What are the advantages of being able to speak multiple languages, beyond just being able to communicate with someone? As our discussion of linguistics draws to an end, take a moment to choose a tribe from the list below. For your assignment, please create a class presentation that demonstrates and informs us about the status of the tribe’s language. As linguists, what do we need to know about these important languages? There are no restrictions on the format of how you present your information. You just need to provide information that addresses the following questions. There are many other choices, both along the Trail and beyond. Teachers are free to customize the list to have it fit the region where they teach. What are the current statistics on language fluency for this tribe? From what language family does the tribe’s language originate? What changes have occurred in the language over time? How do members of the tribe feel about their language? What are the strategies this tribe is using to revitalize their language? How well are these strategies working? What would it mean to all of us if this language were lost? Learning about language should occur in a community and our communities can be very diverse. This diversity should be an asset. For struggling students choose parts of the text that are most important and allow for flexibility in the way the final project is presented. The number of questions to address can be modified and students should be encouraged to show what they know in a way that is most proficient for them. We encourage you to allow students to use innovation of all kinds in presenting a product that is uniquely their own. For advanced learners, challenge the students to propose a new strategy for teaching or preserving a language that might reach a broader or more challenging audience or that might in improve a learner’s ability to engage with the language. For students with unique challenges, teachers should adapt the projects so that the learner is situated for maximum participation and inclusion.